Coorg-born pilots have been the flavour of the season ever since Wing Commander Abhinandan shot down the Pakistan Air Force’s F-16 last month, proving the point that it is not the machine, but the men flying the machine that makes the difference. The Indian Air Force chief drew parallels between Chennai-born Abhinandan’s exploits and that of Squadron Leader Ajjamada Boppayya Devayya flying a Mystere aircraft in the 1965 war, shooting down the superior Pakistani supersonic F-104 Star-Fighter and winning the Maha Vir Chakra posthumously. Another fighter pilot from Coorg, Flt Lt Mandepanda Appachu Ganapathy (in picture), part of the ‘Sabre Slayer’ team of the Indian Air Force, was one of the heroes of the Battle of Boyra, on November 22, 1971. The Battle of Boyra was an aerial interception fought between the Indian Air Force and intruding Pakistani Air Force jets that had crossed into Indian Airspace. Squadron Leader Ganapathy was awarded the third highest gallantry award, Vir Chakra in 1972 for his exemplary skills during the Battle of Boyra, where he shot down a Sabre Fighter Jet. He was in the Air Force working as Flight Lieutenant at the time of the Battle of Boyra and he rose up to the rank of Squadron Leader. During the Boyra encounter, the 22 Squadron stationed in spotted the enemy Sabre Jets on their radar. Within three minutes, four Gnats set off to counter the mighty Sabres. Flight Lieutenant Ganapathy was with Flying Officer Don Lazarus in a formation that included Flight Lieutenant Roy Massey and Flying Officer K B Bagchi in command. The four Gnats separated into two sections. The first section of Gnats was of Massey and Fg Offr SF Soarez as his No.2, and the second section consisted of Flt Lt Ganapathy and Fg Offr D Lazarus. As the Gnats dived in, a section of two Sabres pulled out of the attack and placed themselves in a vulnerable position, just in front of Ganapathy and Lazarus. Ganapathy saw the opening and realised that it was the best time to attack. He gave commands over the radio to Don Lazarus to gun the sabres down. Both the pilots did not waste time on this perfect opportunity. Cannon shells slammed into the pair of Sabres and both the Sabres were badly damaged. Massey, in the meantime, pulled up over Ganapathy and Lazarus to latch onto another Sabre. A vicious fight followed leading to an exchange of bursts. Wg Cdr Chaudhary was in the enemy Sabre. In the dogfight with the Gnats, both Wg Cdr Chaudhary and Flt Lt Massey drifted apart outside the Indian territory to East Pakistan. 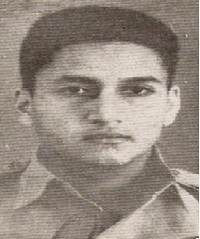 Wg Cdr Chaudhary’s sabre was badly damaged and he managed to land safely in Tezgaon Airfield just outside Dhaka and Flt Lt Massay regrouped and joined his formation. The 22 Squadron was called Sabre Slayers owing to their history of tackling and gunning down the Sabres. Flt Lt Ganapathy and his men did not disappoint this time either as they gunned down three more enemy Sabres and prevented infiltration. You’ve made me feel younger by over four decades…. Yes, I recall this incident since I was based at Panagarh (near Durgapur in WB) and that evening (afternoon, so to say) I had the privilege of relaying the scrambling message on WT (wireless telegraphy) to the concerned units when Ganapathy, Lazrus and Massey took off from Kalaikunda (No.5 Wing) in their naughty Gnats and scored direct hits before returning to the base with DCO (duty carried out). In the first week of September, 1971, I along with five other airmen were sent from Shillong (my parent unit known as No.2 AMCC – Air Movement Control Centre) to No.6 C&MU (Care & Maintenance Unit). Within a fortnight a detachment of No.5 Wing was set up here while the CPWD, better known for their lethargic work had amazingly and commendably undertook the task of converting this civil aerodrome into an operational one for the IAF. We used to stay in tents with the least possible facilities and there was just one huge hangar where a partition was set up for the Detachment Commander of No.5 Wing (Wing Commander Kashikar) and the C.O of 6 C&MU (a Flt. Lt. and he was a Goanese from Bombay) as the ‘Officers Mess’. All of us shared the same food. The fourth pilot was FG Offr Soares and not Bagchi. Bagchi was the radar fighter controller.